1 of 3 Set aside 1/2 cup of the chopped strawberries. In a medium-size heavy-bottom saucepan, stir together the remaining strawberries (about 3-1/2 cups), the sugar and ginger. Bring to a simmer. Continue to cook for 5 minutes, stirring occasionally. Remove from heat and mash berries, until crushed, with the back of a wooden spoon. 2 of 3 Stir in the vanilla extract and reserved strawberries. Allow to cool completely. 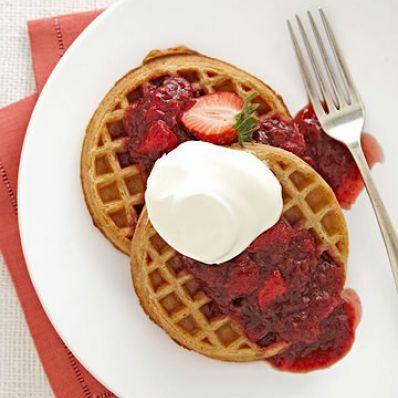 3 of 3 Serve as a topping for ice cream or waffles (see Note). Per Serving: 0 g Fat, total, 0 g pro., 65 kcal cal., 0 g sat. fat, 1 g fiber, 2 mg sodium, 0 mg chol., 18 g carb.